Another Pergola Land custom designed and constructed Hardwood Deck and Polycarbonate Pergola. Our client’s brief was simple – create a spacious private oasis in their suburban backyard. Located in Kellyville Ridge, in Sydney’s Hills District, many of the new homes are designed with a small Alfresco area for entertaining. As a result, we hear our clients telling us the space is just not large enough for them to enjoy. Our team created an extension of the home’s existing Alfresco area. This provided two large separate outdoor living spaces to be enjoyed all year round. We started off with the hardwood deck to cover the existing concrete slab at the backdoor, wrapping it around into the backyard to give the area a seamless entertaining area. Within the deck, we installed a narrow fishpond. 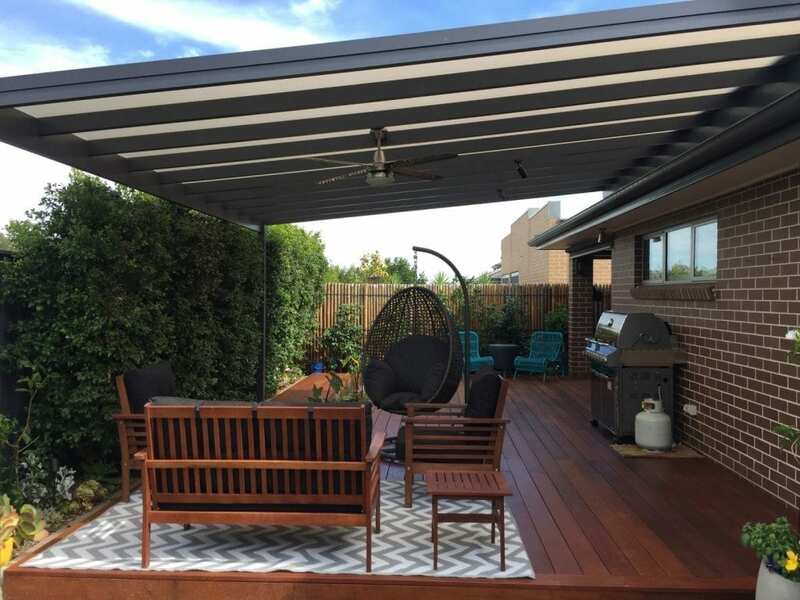 To complete the project, our team constructed a custom designed aluminium framed Pergola. To ensure the area was light and airy, we used the ArcoPlus IR roofing solution. ArcoPlus IR polycarbonate roofing is exclusive to Pergola Land, and supersedes all other polycarbonate roofing on the market. The finishing components of the Pergola were the LED lighting and fan fitted by a qualified Electrician.